The coaching legend speaks about his team’s potential, opponents, and player selection for next month’s World Cup in Brazil. At a recent interaction with journalists, Fabio Capello was happy to chat, debate and joke for almost half an hour. The main piece of headline news came when the legendary coach said he would “absolutely” retire from football after taking Russia to its home World Cup in 2018 under his newly-extended contract. After all, as he pointed out, he will be almost as old then as Alex Ferguson was when he finally quit the Manchester United job last year. That will put an end to a career that has seen an incredible nine Italian Serie A wins as player and coach, two Spanish league titles and the 1994 Champions League with AC Milan. With that record, who could begrudge Capello spending more time with his multi-million dollar art collection? During the meeting with the members of the press he was happy to address almost any issue, although he stopped short of discussing whether specific players were likely or even possible selections for the World Cup in Brazil. With Russia having not played at a World Cup for 12 years and all of the current Russian squad plying their trade in their home country, a lack of international experience could be a weakness, he suggested. As a result, Russia could even be at a disadvantage against their unheralded group stage opponents Algeria, who boast players from the French, Spanish and English leagues. Asked if there was a way back for ex-Arsenal forward Andrei Arshavin or for striker Pavel Pogrebnyak, who played for Russia at Euro 2012 but has not featured under Capello despite some strong form for English Championship side Reading, the Italian was noncommittal. “I check out all the players,” he said, and suggested that Pogrebnyak and Sevilla winger Denis Cheryshev were two foreign-based Russians being monitored by his staff. Perhaps unsurprisingly for a man who left his last job after a clash with management over his choice of captain, Capello was evasive on the topic of who would wear the armband in Brazil. “I don’t know,” he said. “I hope the captain that I’ve got in my mind will be fit.” The position has been held by midfielder Roman Shirokov for most of the last year. 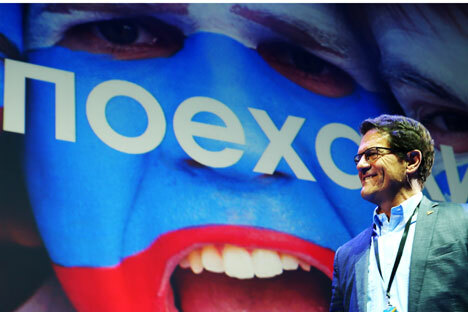 Capello said he had attended the Sochi Olympics in February and that it had given him faith in Russia’s preparations to host the World Cup in 2018, when Sochi will be one of the 11 host cities. “I read a lot of things before the start of the Games, a lot of things that I didn’t see during the Olympic Games: about the security, about attacks, about different things,” he said. Just before we left, there was time for one final small gesture to undermine the image of Capello as a distant, frowning authoritarian. He recommended us Moscow’s best $20 pizza joint.